HD movie download service to follow soon after? 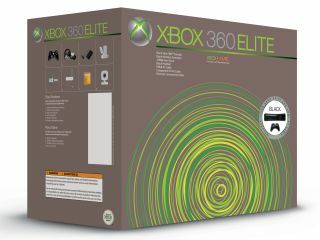 Microsoft has announced that the much-mooted Xbox 360 Elite will launch in Europe on 24 August. The updated Xbox 360 console launched on 29 April in the US to rave reviews and has so far been selling well. The Xbox 360 Elite comes with a boosted 120GB hard drive, a swish black exterior and also HDMI 1.2 ports (not 1.3 - the latest version) to make HD gaming on large televisions a lot easier. It's long-been rumoured that the Elite would launch in Europe in August. But this is the first time that Microsoft has made an official statement on the matter. Microsoft made the announcement at the E3 Expo in Santa Monica, California. It is expanding its Xbox Live Video Marketplace and preparing to launch it in Europe. "We're launching in UK and Ireland, France and Germany first and then rolling out to other countries as soon as we can," said Shane Kim, VP at Microsoft Game Studios. The expanded video-download service will now include movies from Disney and its two satellite studios Miramax and Touchstone Pictures . The Xbox Live Video Marketplace currently offers over 2,000 hours worth of content from 28 different studios and networks, 500 hours of which is in high definition. Back in March, we reported that the 360 Elite was set to launch in the UK at some point in the late summer . An HMV spokesperson spoke to gaming site Eurogamer , confirming: "All we understand is that it's at some point perhaps around the late summer, but we don't know anything beyond that." Then the end of June brought the rumour that the Elite would launch in Europe on the 24 August. And it turns out that the rumour was spot on. Microsoft has yet to reveal any other details about the 360 Elite's imminent arrival, but Play.com is now advertising the Elite online at £329.99. This is £50 more expensive than the current Xbox 360 Premium system, which costs £279.99.